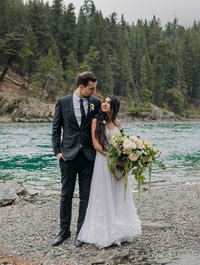 There truly is nothing better than running away with the one you love and getting married in secret; Candace & Cody’s Chateau Lake Louise elopement was just perfect! It was one of those rare days that Lake Louise wasn’t overflowing with travellers and we didn’t have to be patient with people in the background. I met up with them briefly in their room as they were getting ready together (I think more couples should get ready together, it’s sweet!) and then we went out to the middle of the frozen Lake Louise for their wedding ceremony with barely anyone around to watch (that’s an unexpected treat when you get married in Lake Louise, believe me!) and they were married with stunning mountain views surrounding them. It was a cold day (December is pretty darn chilly) but they were troopers and Candace even wanted to take her jacket off for some (brave girl! I love that she was willing to do whatever it took to get great photos!). We stayed around the Lake for photos and then we wandered off down into town near the river for more, just to get a different look. We even got to go out on the frozen river! It was the perfect winter wonderland with freshly fallen snow! I had so much fun with them! Here’s some of my favourite photos from Candace & Cody’s Chateau Lake Louise elopement this past winter! Are you planning to elope? 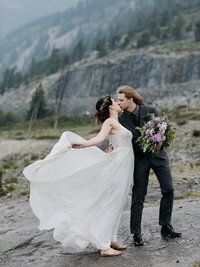 Are you having a Chateau Lake Louise elopement? ENV Photography would love to be the one to capture your mountain destination wedding! Please get in touch for more information on weddings & engagement sessions in Lake Louise and other destinations. If you aren’t in the market for a Lake Louise Engagement photographer or a Chateau Lake Louise Elopement Photographer, ENV Photography also photographs maternity, kids & families! Want to see more Lake Louise Weddings? Check out this Chateau Lake Louise wedding! And this Wedding at Chateau Lake Louise! And check out this Lake Louise wedding! 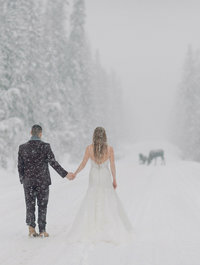 And this Lake Louise winter elopement! 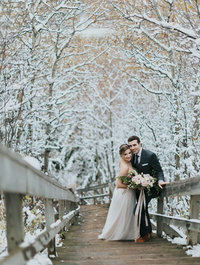 And this Lake Louise winter wedding! She is quick, professional, easy going and will literally climb to the edge of a mountain to get the best shot.